Hello everybody and welcome back to another edition of One Liner Friday’s. Here you can find the past week in sports wrapped up in one line and one line only. Enjoy!! So do you think Sergio Garcia and Riley Cooper are best buds? I think so, I think they hang out at each other’s house and try to come up with ways to alienate themselves and potentially ruin any success they may have ever created leading up to that very moment. I am slightly disappointed that Michael Vick is taking this whole forgiveness route, I don’t know about you but I think Cooper deserves the “Old Michael Vick” treatment. Oh you know just a professional female golfer who’s playing for her 4th consecutive grand slam title. Tiger shoots an opening round 66, making every putt under the sun at the Bridgestone Invitational. This comes just a week after the Open Championship, where he couldn’t putt the ball into a garbage can if it was right in front of him. Let them get away with that? I’m sorry, did The Yankees ask A-Rod or anyone else on their team to do steroids? Are The Yankees, or any team, complicit in the use of steroids? Is Buck Showalter the biggest crybaby known to man? It is amazing how big the target on their back is, and how this is only a “story” because it involves The Yankees. They don’t boo the bad teams. Alabama is clearly the best college football team in the country, but why does everyone get so riled up over preseason rankings? Everyone understands that this is not the same roster from last season right? How about we play the games and see what happens (or let a computer decide everything and not even bother; either way). Canelo Alvarez will hand Floyd Mayweather his first professional loss of his career. Isn’t it hysterical that Greg Oden, who was drafted 6 years ago and still hasn’t played even close to a full season in the NBA due to chronic injuries; get’s to choosethe team that will have the ‘privilege’ to pay him millions of dollars. No, inmate #174954, you will no longer get airtime on my watch; thank you very much! So, Kansas City Chief’s offensive coordinator is obviously messin’ with the same stuff Derek Rose is if he thinks Alex Smith is the best QB in the NFL. I get it, he’s trying to build Smith’s confidence after it was trampled last season, but Smith is not even the best team in his division forget the whole league. 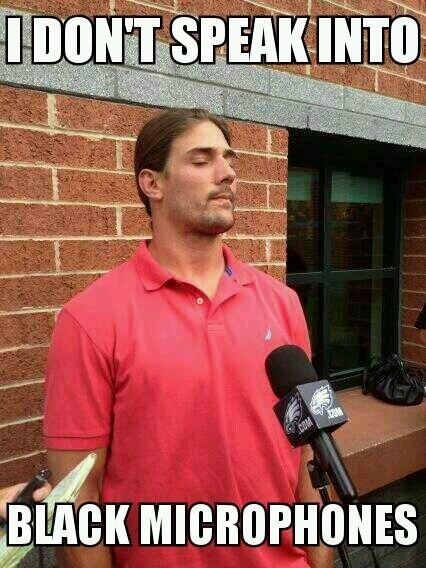 Let me end by saying that what Riley Cooper said is horrible. It is obviously extremely insensitive, and I feel that that word (along with any slur towards anyone) has no place in society. I’m here to bring levity and comedy (hopefully) to the world of sports, so please don’t take offense to anything I say or any pictures I may post even in regards to a sensitive situation. Thanks for reading as always, and I hope you all enjoyed this weeks One Liners.